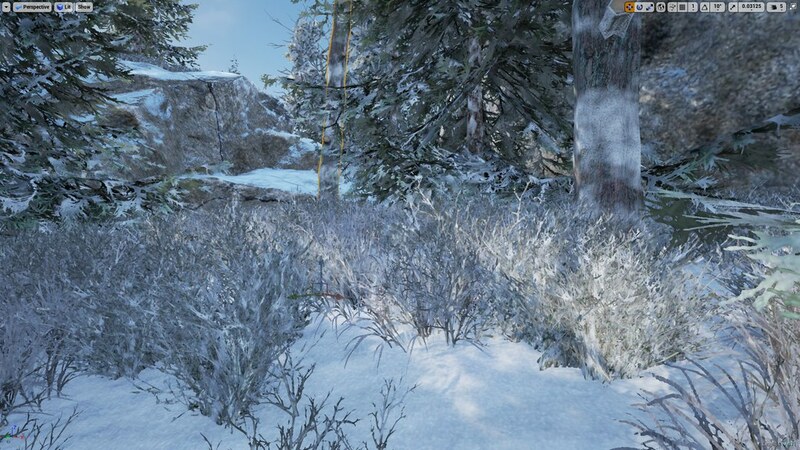 This upcoming example file will show how to set up foliage in Unreal Engine 4 in order to have the region of the foliage that intersects with the ground take on the ground color and eliminate the typical cutlines from polygons intersecting with the ground. The technique is derived from Witcher 3's Red-Engine (page 54 in link) and is called pigment mapping. The technique helps a great deal in creating natural scenes. Blue Budgie Studios, having also a history in landscape rendering, was very excited upon seeing the results for the first time. The technique just makes scenes look more natural, especially with ground like snow and sand, i.e. low complexity ground materials.